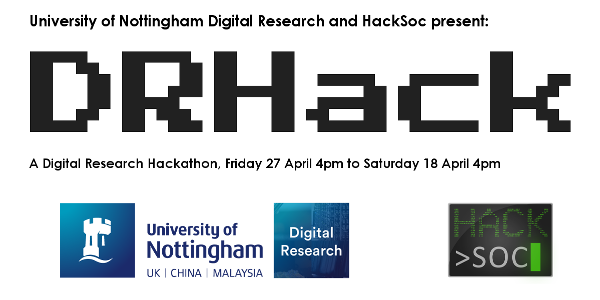 On Friday 27 April and Saturday 28 April 2018, as part of the University Of Nottingham’s Digital Research Week, the Digital Research Team are pairing up with HackSoc to organize a 24-hour hackathon. We are calling all researchers at the University of Nottingham to have their research “hacked”. Students will join together to ideate over your data sets and, by Saturday afternoon, will have created a prototype or proof of concept that turns your research into a compelling technological artefact (app, device, etc.). A Hackathon is a collaborative programming festival. Hundreds of passionate students come together, form teams, share ideas, and help each other build cool technology. It’s a fantastic opportunity for participants to meet new people, learn from mentors, and make cool stuff. Our Hackathon is an inclusive event and invites students of all backgrounds, be they beginners or expert coders. DRHack is a 20-hour long event running from Friday afternoon to Saturday afternoon. Some participants will stay overnight, but this is not an obligation. Major League Hacking provides detailed information on what Hackathons are on their website. Where will the Hackathon take place? A kick-off event, to present the Hackathon, create team, and distribute challenges, will take place on Friday at 4pm in Lecture Theatre A25, Business School South, Jubilee Campus. Teams will then move to the Ada Lovelace Computer Science Laboratory in Computer Science A32, for the hacking itself. Teams will present their prototypes in Ada Lovelace on Saturday at 3pm These prototypes will then be judged by a panel of volunteers, and prizes will be given to the best or most imaginative prototypes. How can I support DRHack? There are two ways you can support the Hackathon: by volunteering a data set or by judging the outcome of the Hackathon. Do you want to see how hacking teams can bring a fresh view on your data set, bring it to life and increase its impact? Submit a data set to be “hacked upon” by hackathon participants! You do not need to be able to attend the Hackathon to propose a data set, although we encourage you to give participants a one-minute presentation of your data set. Make sure as much of the data set is in common, interoperable formats (CSV, JSON, and common image format such as JPEG if your data set contains images). HackSoc and the Digital Research Team will provide help in translating data to the right format if needed. Make sure the data is properly described. Think of it as the “README” file that you would include in a public archive. Make sure there are no restrictions on the data: it must not be of high commercial value, contain sensitive information, or personally identifiable data. Fill in the form at https://forms.office.com/Pages/ResponsePage.aspx?id=7qe9Z4D970GskTWEGCkKHmEEYZ77l51Nu8irvsRa9oNUNExOVERZSjJXMFpKNjI3MkJUNjJGNVlOQS4u to register your interest by Tuesday 24 April 12 noon. Depending on the number of submissions, we may turn down some data sets. In any case, hacking team will be free to choose whichever data set they want to work on, so submitting a data set doesn’t guarantee it’s going to be used. We are also looking for researchers to judge the outcome of DRHack, so prizes for the best prototypes can be awarded. You will have to come to Computer Science A32 on Saturday 27 April between 3pm and 6pm to assess students’ presentations.